YERDUA has started a donation pool! Any spare points would be greatly appreciated! Mini Raffle (WINNER ANNOUNCED)HELLO thank you so much for participating in my raffle guys <3 We got a TON of data and are excited to share our findings once we finish writing up our paper!! I've been working on a research project at my uni this quarter -- my parter and I are testing to see the different ways artists interact with their communities on various social media platforms (DeviantArt, Twitter, Instagram, etc). Since I never finished the commission from my last raffle, I'll be picking two winners this time around at the end. 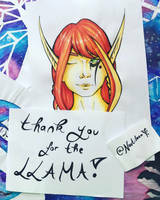 Thank you so much for the llama. I really appreciate him/her/them.